As many of you know, Antonio Stradivari has made over a thousand instruments. However, I found this one very interesting. The Charnot Chardon is a violin built in 1718. It has been owned by Timothy Baker and Joshua Bell, and is currently loaned to Simone Lamsma. What's so curious about it is it's format - instead of the standard violin shape, the instrument is shaped like a baroque guitar. And, of course, the sound is really good - it's a Stradivarius afterall. I personally think the instrument looks and sounds great. I'd love to own a replica, if there even is such a thing. I've seen Carbon Fiber instruments before that don't have the Cs, but it'd look great on wood. Isn't that so very very cool. Thanks. IT is utterly Gorgeous. Off topic, (sort of) I watched a PBS Special with Joshua Bell. He was mentoring a group of kids to play in NYC. IT was a chance of a life time for these kids. I became a bigger fan of J. Bell. I love his passion when he plays. Thanks for sharing the video. I've seen violins shaped like that on eBay. Actually, eBay has a few different "baroque" designs. For something completely ostentatious, have you seen the Norwegian design? I've attached a picture of it. On the playing, wow, just wow! She is amazing. i especially like the shot from behind showing her left hand while it was just dancing on the fingerboard. I need to get my thumb to do as hers does. Mine rides up a bit more. I love the passion she shows while playing. What an amazing piece and just as amazing performance Thank you again for posting that. I was completely unaware of that design. Thanks. Great video too. This sounds interesting! I'll take a look during next weeked, if I have time. You're welcome! always nice to have someone to share this as well. That is a very interesting sounding instrument indeed. I found another video, of Annbjorg Lien playing it. BTW, how do you link the YouTube video like that? You can get something similar from Tim Phillips in the UK. Not a Strad, of course, but nice all the same. That was awesome! loved her performance. To link the youtube video like that, all I did was to copy the video adress into my post. Nice! wish I had that much money to buy it, though. Absolutely gorgeous. The sound is amazing, it's really something out of this world even though I'm more into Amati sound violins. Stradivarius intimidate me. @iBud How I loved to get one of those! Very unique. 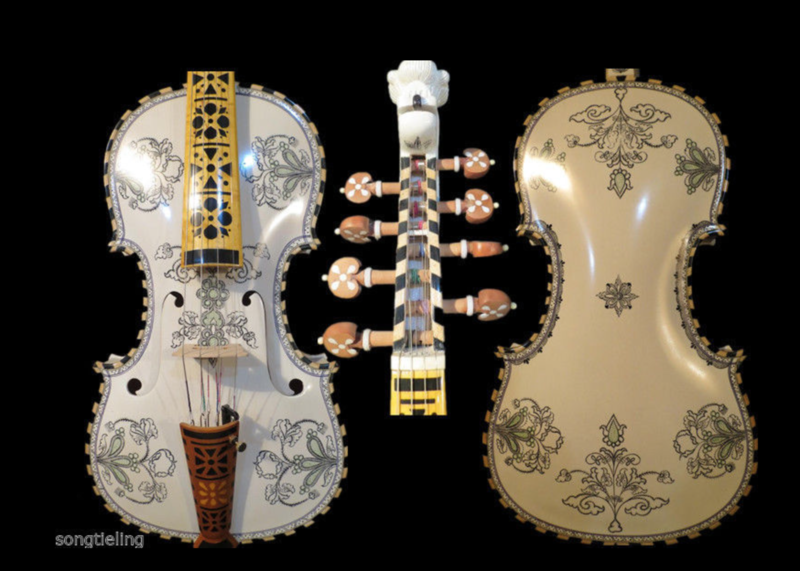 It reminds me of the porcelain violin we have in Antique Art Museum in Lisbon. That looks awesome! I wonder if it's playable. I wonder if porcelain would actually resonate well.. I also happen to be an ocarina player, and clay resonates pretty well, but I don't know about porcelain. That is a gorgeous violin! I don't that I would think of playing it. I think I would simply look at it and admire the amazing designs painted on it. The artwork is as beautiful as the violin itself. Wow, just wow! What an amazing instrument! You also have a very nice instrument. Over 100 years old? Wow, I wonder how good it sounds. I don't think mine is pretty young, although the sound it creates is shaped by the musician or "person trying to play the instrument", in my case. Someday, I would like to buy an old instrument, but that will be after I get a bit better on the one I have. I'd actually like to find an old 5-string fiddle. @augustoad - I never thought if it was playable when I saw it, but it's a really good question. I might ask my teacher. Remember that what we hear under our ear is not always what a listener hears ...just sayin'. Playing with different sets of strings helps and the enviroment differences too, but I was talking generally. I have played with a collegue who has this "stradivari personality" violin and even when he changes strings to warmer ones, the sound overpowers the rest. It's beautiful listening to, but in a player perspective, it's too overwhelming for me hence saying it intimidates me. I'm a quieter and warmer person It's personal taste.